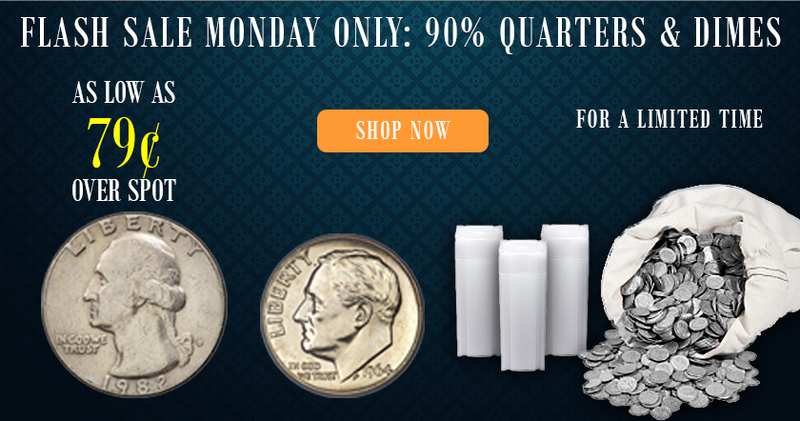 Blog - Flash Sale on 90% Dimes & Quarters! Flash Sale on 90% Dimes & Quarters! At Monument Metals, 90% pre-1965 “junk” silver coins are one of our main focuses. Why? We think they’re the best deal in bullion – and our clients agree! These coins are U.S. Government-issued, available in small convenient units, and priced at a minuscule premium. In today’s market, savvy investors can pick up 90% silver for half the premium of American Silver Eagles. Since we trade heavily in 90% silver, we often get offered large and unusual deals of the material. This past week was no exception. Even though premiums have been creeping upward on many bullion products, we bought a significant quantity of 90% Dimes and Quarters at a very attractive rate. Our fortune is yours too: we’re offering a one-day sale on 90% junk Dimes and Quarters at the lowest prices of any major dealer. Whether you’re looking for small quantities or large, we’re offering outstanding wholesale pricing to all customers. We have to stress: these premiums are for today only. With spot silver in flux and physical demand on the rise, we cannot guarantee this price beyond today.